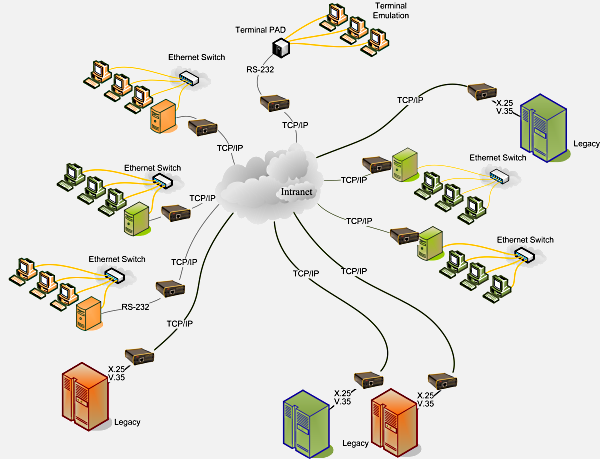 Advanced Relay is frequently asked to help integrate legacy equipment into modern TCP/IP networks (e.g. X.25 over TCP/IP). The legacy systems use some type of synchronous signaling (e.g. bit synchronous or byte synchronous). They use physical interfaces defined by standards such as RS-232, RS-422, EIA-530, X.21, V.35. And they use outdated protocols such as X.25. Gateways that convert from an old protocol to a new one are the solution. But a gateway can be implemented in different ways and at different levels of complexity. A gateway can be used to convert the physical layer, or it can also be used to convert the protocols at upper layers. For instance, people have often heard of XOT and imagine this is the best way to solve the problem of integrating legacy X.25 equipment to TCP/IP networks. Actually, this is not the best solution as we will explain in the following pages. In this section we show how Cisco's XOT works, how our LayGO® XOT client can be used to interface to legacy equipment through Cisco XOT routers, and then how this solution can be greatly improved by using the PXSe as an X.25 to TCP/IP gateway. We also show an even higher level solution where the PXSe autonomously extracts data from higher level protocols (e.g. FTAM) and acts as a client to a file server to deposit the data in a remote file server (FTAM Gateway Application).